This sweater is more than a year in the making. 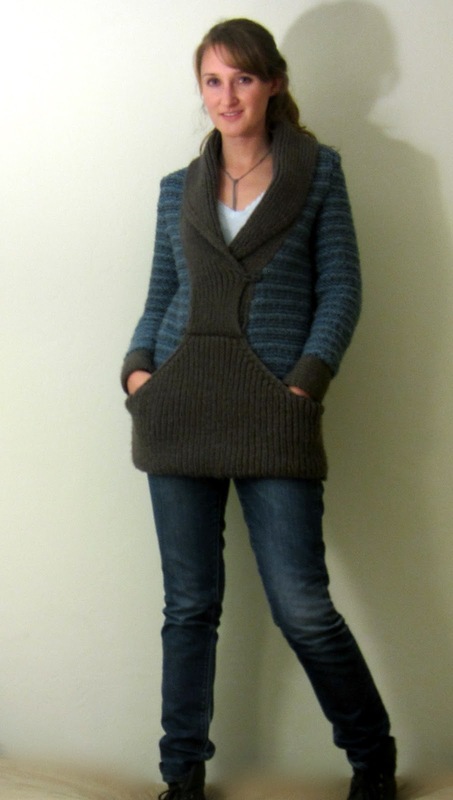 It first started when I found some more of Vanna's yarn on sale at the fabric store and decided to buy a whole bunch in Taupe to make a sweater that I had had in my head for a while. Originally, the project was going to be a bomber-style jacket like the one on the right from Anthropologie. 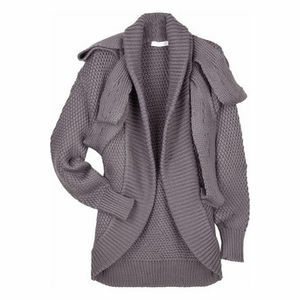 But I had since bought myself a ready-made one, and so I decided to do a simple cardigan like the one below from Zara. I always find myself admiring simple sweaters with good texture, and so I got to work. But after nearly completing the body, it just wasn't fitting right, and so I abandoned the piece. 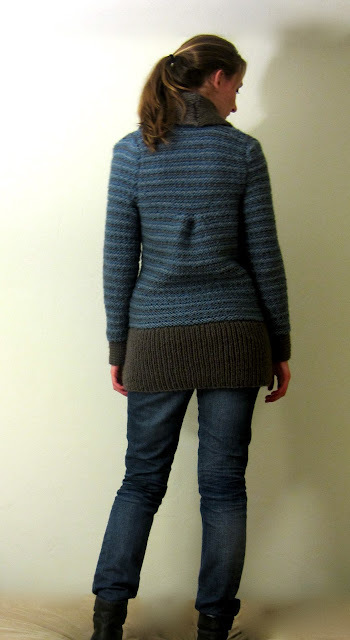 People are usually horrified when I decide to change a project after doing most of the work, but I'd rather have something wearable than an ill-fitting sweater in the back of my closet. Rather than do it over again in a larger size, I started looking for a new pattern--one a little more sophisticated than my make-it-up-as-you-go variety. And so I began to use my remaining Vanna yarn to make something entirely different. I picked up a pattern for this sweater on sale at Vogue Knitting and decided to try it out. I started it at my boyfriend's place when he was moving in and had no internet to entertain me, and have been working on it a little every night while watching The Wire. In the intervening months I have since moved on to Say Yes to the Dress and Intervention (great, now a good knitting habit is turning in to a bad TV habit). It's also been useful on the occassional long train ride to the city. After I finished the front pocket, I was wishing that I had some different colors to mix it up, so I popped in to Jo-Anne's to pick up some more Vanna in Dusty Blue and Silver Grey. Now it's actually turning out a lot like the pattern picture. 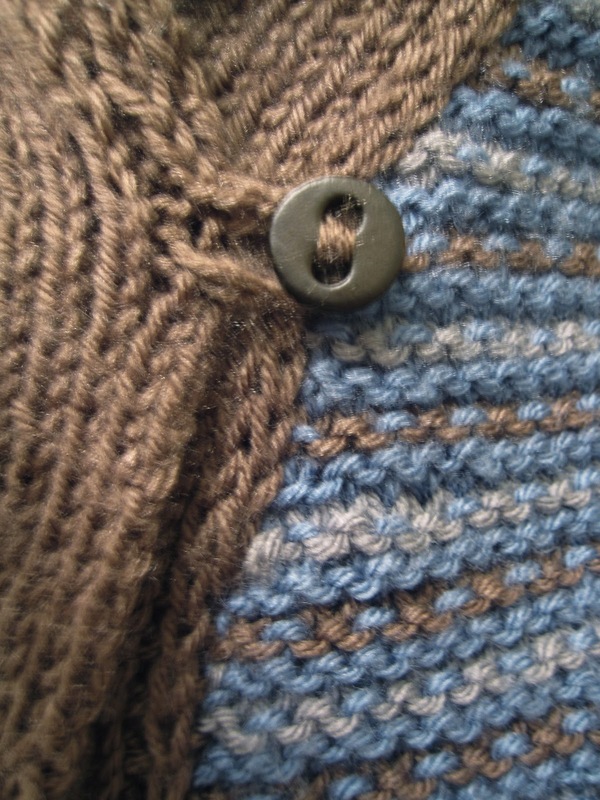 Vogue patterns are often made for very small gauged yarn, and I like mine to knit up a little quicker. After knitting a test swatch, I recalculated the pattern as I went using 95 stitches to cast on compared to Vogue's 143, and this became the basis for my conversions. The neck is a little long and the sleeves and sleeve caps needed to be made longer, but nothing a little patience couldn't solve. And with a year to do it, patience was what I had. Of course, don't be fooled, a more dedicated knitter will make this up in no time. Awesome! I see you take BART... :-) You might see me knitting on there sometime. 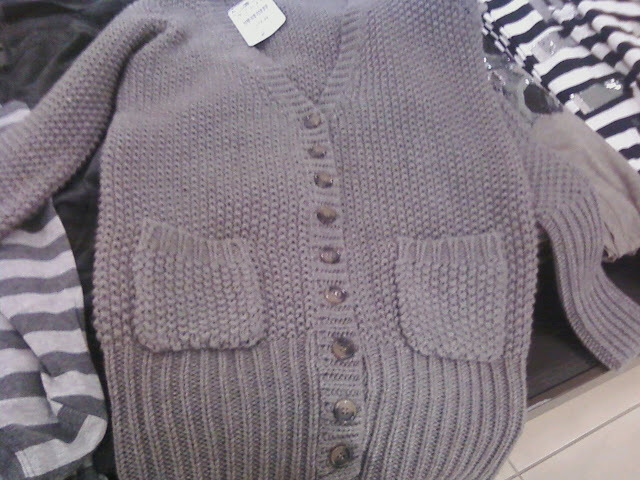 LOVE this sweater. Great work! Your version of this pattern turned out great!